"To Normalize the False Teachings of Mormonism the World Over"
Placing a Mormon in that pulpit would be a source of pride and a shot of adrenaline for the LDS church. It would serve to normalize the false teachings of Mormonism the world over. It would also provide an opening to Mormon missionaries around the world, who could start every conversation: "Let me tell you about the American president." To elect a Mormon President is to advance the cause of the Mormon Church. Yes, like the election of Richard Nixon normalized the teachings of Quakerism, and the election of Clinton the teachings of Southern Baptists. Anyway, further discussion of the evangelical division about Romney's faith may be found here, and doubtless in a million other places in the months to come. As for said pending discussion, don't you know that you can count me out. Our friend Joanna Brooks is about to fire up a post about this, so I'll update here when that is up. Update: It gets worse. Joanna recounts her conversation with the author here. In the meantime, that little blast from the past requires an antidote, so here's an interview with the South Park-ers Trey Parker and Matt Stone talking about their musical The Book of Mormon, the full soundtrack of which I'm looking forward to hearing sometime soon. Maybe they'll follow with a sendup musical about the United Church of Christ, or the Unitarian Universalists. 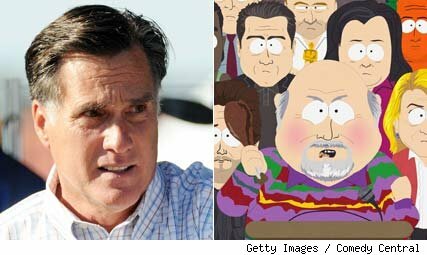 Update: Also, I meant to put this in the original post, but blog friend and part-time basketball analyst Matt Bowman of Georgetown University reflects here, in The New Republic, on the comparative "business Mormonism" of Romney and contrasts that with the much hipper public image of Jon Huntsman. Taking the two together, he says, suggests a sort of generational shift in internal LDS dynamics and culture. Very interesting reading. I'm currently sitting in a session at the Mormon History Association's annual meeting on anti-Mormonism in the late 19th century. Warren Smith continues a long a not-so-distinguished tradition of ignorance. His interview with Brooks is almost unbelievable. Self-righteous jackasses waxing poetic about what "history teaches us" never ceases to amuse me. Also, the Book of Mormon Musical's soundtrack is pretty awesome. Enjoy.